Valve Cavitation Research Centre (VCRC) is established during August 2017 which is indented for carrying out FL test , cavitation performance test on control valves and associated research works. It is designed for pipe diameter of 200mm with a maximum flow rate of 800m3 /hr. 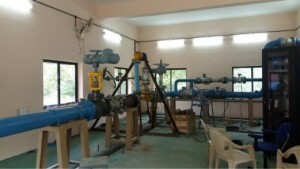 The facility consists of Four Horizontal pumps with intake from the sump of Large Water Flow Laboratory.